If you have a curious kitty and a Christmas tree, you know there is a chance that you’ll find your ornaments on the floor, gifts with little claw marks on them, and a cat perched in your tree peeking out at you. Wrap some tin foil around the trunk of tree to repel your cat. Cats don’t like the the feeling of tin foil or the sound and will often run away. Spray the tree and some of the decorations with citronella spray. The smell repels cats but may also repel you so use it sparingly. Place a floor runner under the stand of the tree upside down. The little bumps feel weird to cats and they tend to stay away from the texture. Place ornaments that are sentimental or more expensive higher up on the tree with strong hooks so your cat won’t knock those one off as easily. Consider placing the tree on an elevated stand if it’s short using a milk carton or box. Secure your tree using fishing line and some hooks placed in the wall or ceiling. Orange peels that are laid around the base of the tree will repel your cat. Cats do not like citrus and will stay away from anything that has that scent. Remember to throw them out when they are dried up and old. Double-sided tape placed around the base will repel your cat when they step on it and it’ll keep them from coming near the tree again. If you’re able to supervise, keep a squirt bottle nearby and spray your cat if he tries to scratch or climb the tree or play with the ornaments. 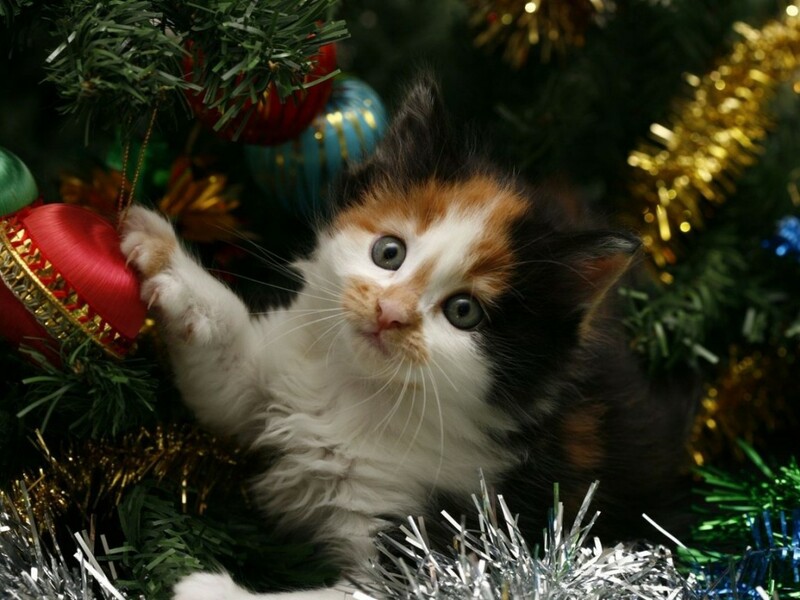 To a cat, a decorated tree is like a gigantic toy! **We don’t really advocate tying dogs to trees, indoor or outdoor. In all seriousness, some cats don’t care and will just sniff the tree and have nothing more to do with it. Outsmarting your cat can become a comedy sketch but if you keep the shiny ornaments off the lower branches, keep some orange scented items near the bottom, and make sure the cat doesn’t drink the water in the stand, your holiday should be peaceful and nice. You may even have some great photo opportunities of your cat snoozing among a pile of gifts under the tree and looking unbearably cute. The best tip I ever heard was to tie a piece of monofilament fishing line to the top of the tree and anchor it to a side wall or, even better, the ceiling overhead. This keeps even the most energetic tree climber from knocking over the tree!